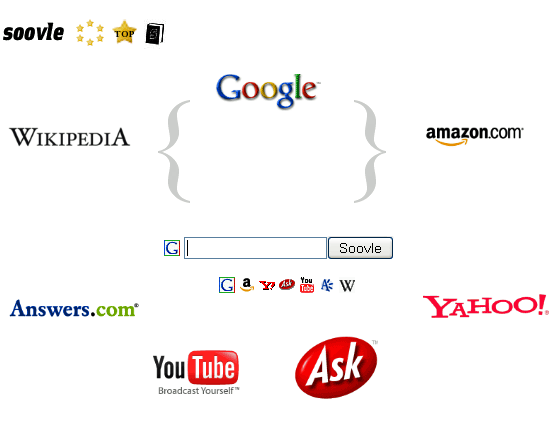 Soovle is a search suggestion tool that instantly suggests searches to your search keyword from 7 popular search engines: Google, Yahoo, Ask, YouTube, Amazon, Wikipedia and Answers.com. Just start typing to view search suggestions. This site is very useful if you want to find a more precise search term to get better and more relevant search results. If you found a relevant search from suggestions, click to select it and double click to immediately search on the destination site. To change your default search engine, click on the icon below the search field. Save search terms by dragging them to the book icon that appears on the upper left side. The above mentioned search engines are set by default, you can easily configure to include/exclude other search engines as well. Other available engines: Live Search, eBay, Buy, Netflix, ChaCha, Cuil, QQ, GoodSearch, Yandex.ru, Naver.com, YouKu and Hulu. Search keyword suggestion tool that helps to find the search term you are looking for. Get instant search suggestions from 7 major search engines: Google, Yahoo, YouTube, Amazon, Wikipedia, Ask and Answers. Click once to select the search term, double click to see search results on the destination site. Save search terms during your browser session. Other available engines: Live Search, eBay, Buy, Netflix, ChaCha, Cuil, QQ, GoodSearch, Yandex.ru, Naver.com, YouKu and Hulu.